Brooklyn, New York— Endeavor Detroit is excited to announce Jim Meeks, the entrepreneur behind MOVE Systems International has been selected to join the Endeavor Network. 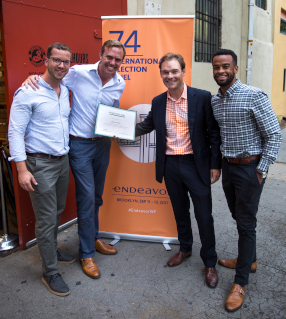 Meeks and his Grand Rapids-based manufacturing company was selected at the 74th Endeavor International Selection Panel (ISP) by a series of panelists, who were drawn from Endeavor’s extensive international network of business leaders and investors. Meeks was one of 26 high-impact entrepreneurs representing 18 companies and 13 countries who were selected at this ISP. Post-selection, Endeavor Detroit provides the entrepreneurs with a world-renowned suite of services and programs along with access to an exclusive mentorship network to accelerate the growth of their companies. A major benefit of selection to Endeavor Detroit includes introductions through a network of more than 3,000 local and international business mentors for strategic guidance in raising capital and entering new markets. MOVE Systems International, founded by Meeks, is focused on modernizing the mobile food industry by providing a healthier, safer, and environmentally friendly food cart platform that can service both world renowned food brands as well as up and coming culinary entrepreneurs. MOVE Systems began by standardizing and upgrading the $1.2B New York City mobile food landscape with its state-of-the-art, eco-friendly food carts, and is now looking to expansion to other geographies throughout the US and beyond. Tacking on a full suite of end-to-end fleet management services, MOVE helps food retail brands and restaurants take to the streets by handling everything from the food cart manufacturing to the customer analytics. Additionally, through its subsidiary Simply Grid, MOVE is working with the New York Fire Department and major hospital systems to reduce carbon emissions and cut energy costs for their mobile fleets. MOVE has become part of the country’s economic fabric by promoting entrepreneurship, supporting the veterans of our armed services, and manufacturing locally, all the while being a steward of the environmental sustainability movement within the world of mobile food and urban life. In Meeks, panelists saw an entrepreneur with incredible grit and tenacity. The panelists were impressed with Meeks’ ability to manage a complex business model while remaining true to his community through education and employment. Panelists valued his persistence to keep production in Michigan, continuing the state’s manufacturing legacy. Now selected as an Endeavor Entrepreneur, Meeks will look to the mentors of the Endeavor Network to assist in expanding his growth strategy, including access to new markets—both domestic and international. Headquartered in New York City, Endeavor currently operates in 30 growth markets throughout Europe, Latin America, North America, Africa, Southeast Asia and the Middle East. The Endeavor Detroit affiliate was established in 2015 and works with Entrepreneurs and mentors throughout the State of Michigan. Endeavor Detroit currently works with 18 entrepreneurs leading 10 companies including Algal Scientific, Banza, Benzinga, DROUGHT, DWM Holdings, Floyd, McClure’s, MOVE Systems International, Varsity News Network, and Vectorform. MOVE Systems International is focused on modernizing the mobile food industry by providing a healthier, safer, and environmentally friendly food cart. Additionally, through its subsidiary Simply Grid, MOVE is working with the FDNY and major hospital systems to reduce carbon emissions and cut energy costs for their mobile fleets. We have become part of our nation’s economic fabric by promoting entrepreneurship, supporting the veterans of our armed services, and manufacturing locally, all the while being a steward of the environmental sustainability movement within the world of Mobile Food and urban life.